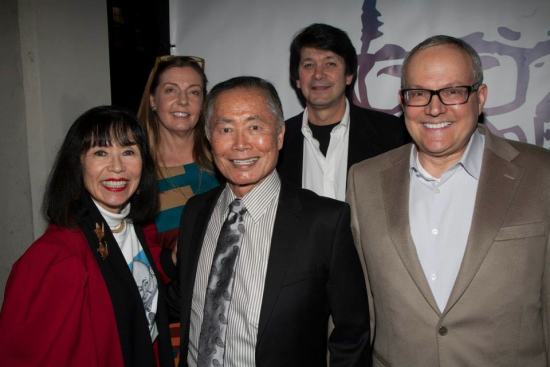 Takei Keynotes Korematsu Day Event in S.F. You are at:Home»English»Community News»Civil Rights»Takei Keynotes Korematsu Day Event in S.F. George Takei speaks with an image of the late Fred Korematsu projected behind him. SAN FRANCISCO — “Stand Up for What Is Right” was the theme of the annual Fred Korematsu Day celebration, held Jan. 30 at the Nourse Auditorium in San Francisco. 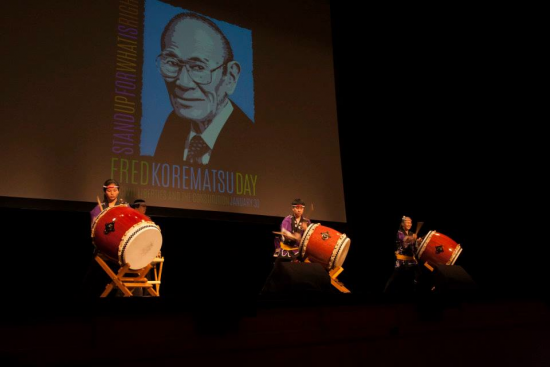 Presented by the Fred T. Korematsu Institute, this year’s program marked the 10th year since the civil rights icon’s passing. Jan. 30 would have been his 96th birthday. 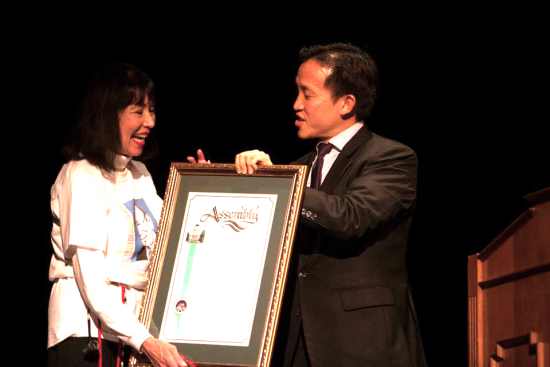 Karen Korematsu receives a proclamation from Assemblymember David Chiu of San Francisco. Karen Korematsu, Fred Korematsu’s daughter and the founder and executive director of the Korematsu Institute, gave opening remarks. She was presented with a Korematsu Day resolution by Assemblymember David Chiu (D-San Francisco). Other speakers included San Francisco Public Defender Jeff Adachi, who has led protests against police shootings of unarmed black men, and Theresa Sparks, executive director of the San Francisco Human Rights Commission and one of the most prominent female transgender activists in the nation. The program opened with taiko by Genryu Arts under the direction of Melody Takata. Spoken-word artist Fong Tran performed “Dream Young Man of Color” and a video about the Korematsu case featured students from the Japanese Bilingual Bicultural Program at Clarendon Elementary School. 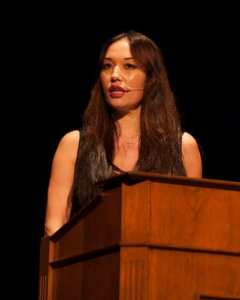 Award-winning journalist, author, poet and entertainer Francesca Yukari Biller served as emcee. Since 2010, California, Hawaii, Utah, Illinois and Georgia have recognized Korematsu Day by statute, legislative resolution or proclamation by the governor. Michigan, Pennsylvania and Virginia have considered or are considering legislative recognition. 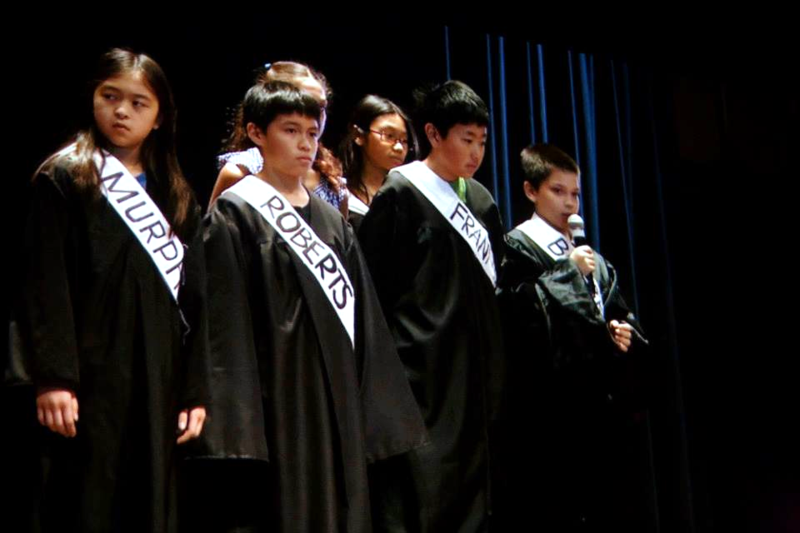 The program included a video about the Korematsu case, created by students from the Japanese Bilingual Bicultural Program at Clarendon Elementary School. The U.S. Commission on Civil Rights has also urged President Obama and Congress to establish Fred Korematsu Day as a national holiday. Following is an edited version of Takei’s keynote address. The other thing that’s special about San Francisco is that this city has always been a hotbed of activism for justice and equality for all the people that have been marginalized by society. That is very important … because throughout American history, Americans who cherish the principles of our democracy and who have the guts to match that democracy have had to stand against the stiff wind of injustice, inequality and ignorance. 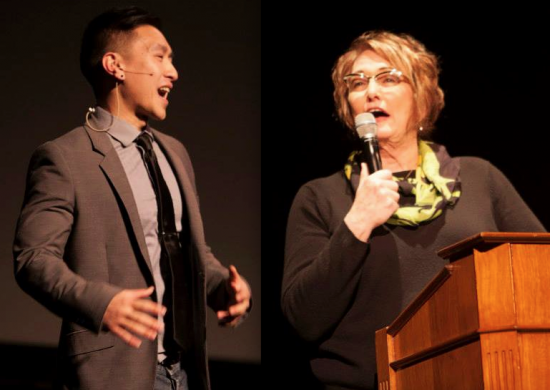 Left: Spoken-word artist Fong Tran. Right: Theresa Sparks, executive director of the San Francisco Human Rights Commission. To this distinguished list of people that spoke up we add another name, an Asian American name, Fred Korematsu. He was a Japanese American, born in Oakland, right across the bay from us here. He stood against the awesome might of the government of the United States. On Dec. 7, 1941, Japan bombed Pearl Harbor … Overnight American citizens of Japanese ancestry were looked on with suspicion and fear and outright hatred, simply because we looked like those who bombed Pearl Harbor. Despite that, young Japanese Americans … rushed like all young Americans to their recruitment centers to volunteer to serve in the military. Journalist Francesca Yukari Biller served as emcee. Into this scene comes another extraordinary American, a man named Ernest Besig. He was the executive director of the Northern California chapter of the American Civil Liberties Union. He was in conflict with the National ACLU, which was closely aligned with the Roosevelt Administration. They had urged Besig to not contest the internment. Yet despite that, Ernest Besig went and visited Fred Korematsu in prison and he asked him to serve as the plaintiff in a test case challenging the internment. They challenged the internment all the way up to the Supreme Court … and in 1944, with the war still raging on, with a 6-to-3 vote the Supreme Court ruled against Fred Korematsu and upheld the internment. It was a shameful ruling that the Supreme Court made. Taiko performance by Genryu Arts. So Fred again got galvanized, this time with a team of young, sharp attorneys spearheaded by an outstanding San Francisco lawyer, Dale Minami. And they challenged it, and in federal district court, the original (conviction) was vacated … That 1944 ruling still exists … but in essence, Fred Korematsu won. The Constitution prevailed. It was a powerful moment and it was Fred’s determination and tenaciousness and the brilliance of his attorney team that brought that about. There are important lessons today still to be learned from that ruling. We live in another time of tension, an age of terrorism … We have in the United States many generations of Arab Americans. Some are Muslim. Not all Arab Americans are Muslim. And yet they look (to others) like terrorists. There is an important lesson to be learned from Fred Korematsu’s challenge. In the Japanese lexicon, there is a phrase, shikata ga nai — nothing can be done. When the internment came about, so many Japanese Americans went into imprisonment under the philosophy of shikata ga nai. Fred didn’t believe in that notion. He stood up. He spoke out. This was in the great classic American tradition … of suffragettes who marched for equality for women … of the African Americans who struggled for civil rights, and in the same tradition that Harvey Milk fought for equality and the gay liberation movement. This is what makes America strong — people who have faith in our ideals and the guts to stand up for them. Fred Korematsu … was an ordinary man who did extraordinary things, and with that he made history. He was presented with the Presidential Medal of Freedom. 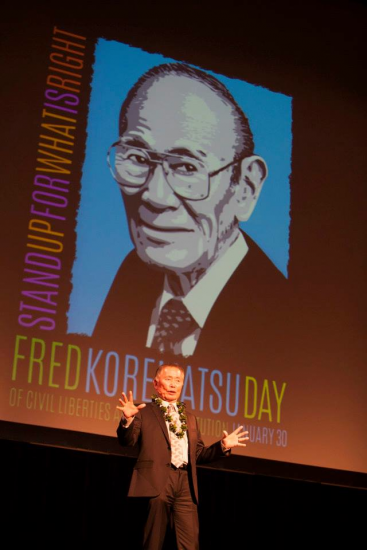 This day, Jan. 30, has been deemed by the State of California as Fred Korematsu Day. So on this, the 10th anniversary of his passing, we honor him and take pride in his contribution to making our country a better, truer, stronger democracy. Front row: Karen Korematsu, George Takei, Brad Takei. Second row: Cecy Jones-Korematsu, Ken Korematsu (Fred Korematsu’s son).